← First Place Goshen Retreat Bra Decorating Contest Goes To Team Kauffman Medi Spa! INDIANAPOLIS – For the 24th year, the Indiana Sportswriters and Sportscasters Association is pleased to announce its incoming Hall of Fame Class, set to be inducted at its annual awards banquet to be held on Sunday, April 7, at Valle Vista Country Club in Greenwood. Included in this year’s group are two well-known area broadcasters in WRSW’s Rita Price and WHME’s Chuck Freeby. The class is based upon those who have served Hoosier newspapers, radio stations and television airwaves over the past several decades. The Indiana Sportswriters and Sportscasters Association was founded in 1946. It created its Hall of Fame 50 years later in 1996. With the addition of the Class of 2019 the Hall of Fame will have 117 members. Price has been on the WRSW airwaves in Warsaw for nearly six decades, and she has spent 46 years covering local sports for the station. Her voice is synonymous with basketball and football games, calling the IHSAA state playoffs for over four decades. 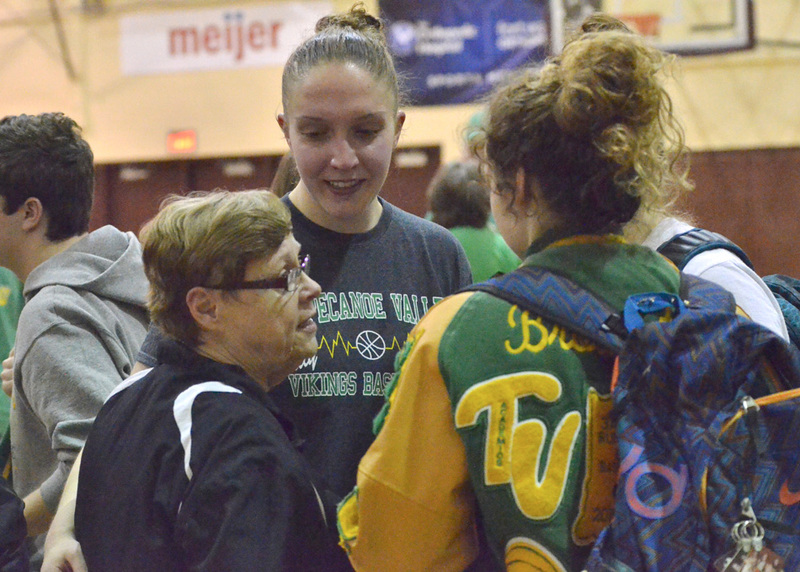 Her and radio partner Tim Keffaber have become the voice of the Tippecanoe Valley Vikings football and basketball programs, and travel the area promoting WRSW-area basketball teams as well. Price is already a member of the Indiana Broadcasters Hall of Fame and the Indiana Basketball Hall of Fame. In 2017, she celebrated her 75th birthday by broadcasting 75 games on WRSW: 10 football games and 65 basketball games. Freeby, a 1986 graduate of the University of Notre Dame, has been a voice of various levels of sports in the area since that time. For 17 years, he covered high school sports for WNDU-TV. For the past 15 years, Chuck has served as the Sports Director of WHME-TV channel 46, handling play-by-play duties for the high school Game of the Week, as well as serving as the voice of Notre Dame baseball on WHME radio. in 2017, Freeby was named the ISSA’s Marv Bates Sportscaster of the Year. Gordon Engelhardt, Evansville Courier & Press – After graduating from Southern Illinois University in 1979, Engelhardt has called Evansville home since 1984. His sports coverage over the years has ranged from all things college basketball, such as the Final Four and the Elite Eight at the Division II level, to the IHSAA state finals. He’s also covered the Thunder on the Ohio hydroplane boat race for more than 20 years. Mike Haynes, former voice of the NHL’s Colorado Avalanche – Haynes got his start calling Butler University football and basketball games while a student there in the early 80s, and then began his professional career at WCVL radio in Crawfordsville. Haynes moved to Arizona to pursue his dream of calling hockey professionally in 1988. He had moved to Denver to broadcast minor league hockey when the Quebec Nordiques moved to Denver to become the Avalanche in 1995. He spent 23 years as the radio or TV voice of the team. Robin Miller, NBCSN, formerly of the Indianapolis Star – Miller began writing for the Star at the age of 18, and he spent his formative years as a writer travelling with the ABA Indiana Pacers. Miller also raced sprint cars and worked for Indy 500 crews while chronicling various forms of motorsports over the years in Indy. Miller became a columnist for the Star in 1987. After leaving the Star in 2001, Miller worked for both ESPN and Speed TV, covering IndyCar racing. In addition to his TV work for NBCSN, he currently writes for Racer Magazine and Racer.com. Art Saltsberg, WOWO Fort Wayne – Saltsberg co-hosted the evening sports talk program on WOWO from 1985 to 2000. He also served as the play-by-play voice for high school sports on WOWO for a large portion of the 1970s.These days, he serves as the color analyst for Purdue-Fort Wayne basketball on WOWO’s sister station, ESPN 1380. In addition to these new Hall of Famers, the Indiana Sportswriters and Sportscasters Association will recognize winners of the following annual awards: the Marv Bates Sportscaster of the Year, the Corky Lamm Sportswriter of the Year, the Ron Lemasters Lifetime Achievement Award, and the Bob Williams Helping Hand Award. Marv Bates Sportscaster of the Year: Rick Semmler, WTHI Terre Haute – Semmler has been the Sports Director of WTHI-TV for nearly a decade, and he has been covering sports in the Wabash Valley for 16 years in total. His passion for high school sports is on display with the level of coverage he gives to schools in the Terre Haute viewing area, including both those from Indiana and Illinois. Semmler has previously won the IHSAA Distinguished Media Service Award, a Spectrum Award from the Indiana Broadcasters Association and three local Emmy awards. Corky Lamm Sportswriter of the Year: Mike Carmin, Lafayette Journal & Courier – Carmin has now been a fixture in Lafayette for 30 years. He began his career as a freelance reporter covering high school sports and Purdue women’s hoops, which led him to follow the team on its way to the national championship in 1999. His coverage of that team won a national award from Gannett. For nine of the past 10 seasons, he’s been the beat reporter for Purdue football and women’s basketball for the Journal & Courier. Ron Lemasters Lifetime Achievement Award: Steve Fields, formerly of the Greencastle Banner-Graphic – Fields has been writing about Hoosier athletes since 1974 at a variety of stops, but he is best known for his time as the sports editor of the Greencastle Banner Graphic for all but two years from 1978-99. Since 2000, Fields has been a correspondent for the Terre Haute Tribune-Star. He was named the Corky Lamm Sportswriter of the Year in 1996. He served as the president of the Indiana Sportswriters and Sportscasters Association for a total of five years over two different stints. Bob Williams Helping Hand Award: Mike Skvara, ESPN 97.7 The Ref – Skvara has served as both a member of the media and as someone who has assisted the media during a career that has spanned four decades. Skvara has called the Evansville area home for 30 years, and has assisted the Evansville Memorial High School football program during that time. However, he also has served as a media coordinator for 34 of the past 36 IHSAA football State Finals, as well as in that same role for more than 50 boys and girls basketball State Finals. During the football season, Skvara serves as the color analyst for high school football coverage on WREF in the Evansville area.